Reserve Fleur De Lis Today! Thank you for your review, Karena! We do apologize that the arcade was not working when you were here, but we did want to update you and let you know that it has been repaired. We look forward to having you book another stay with us again soon! During the stay here we encountered a leaky window, toilet handle was broke, and place could have been a little cleaner. It was amazing, clean and although very close you felt secluded, do wish side shutters like by hot tub was on each side to have more privacy. Other than that we had a wonderful, relaxing, sweet retreat here! It was one of the most beautiful experience, the staff is very friendly we had trouble with the cable connection and they send a tech right away. The cabin had such beautiful views even though it was a gated community we loved it! We would definitely be staying there again. We had a great time in Pigeon Forge and really enjoyed this property. We would definitely stay there again. We did have an issue with our back deck not being cleaned but they came right out after I called to handle it. And they were very friendly. We also noticed some dusting issues throughout the cabin. We didn't report that, but it didn't bother us. We would definitely recommend this property and would stay again! It was very accommodating and the kids (and adults) had a blast with the pool table! We stayed in Fleur de Lis for a long weekend with our family. There was plenty of space for ourselves and our extended family to spread out. The cabin was clean but the only reason I did not give a 10 is because the day we arrived there was Poison Oak all over the porches and near the hot tub. Luckily my husband and his father cut it all away before any of the kids were exposed. The amenities were great. The kids had a blast with the pool table and arcade game downstairs. Only reason I did not give a 10 is because the Wi-fi did not work our entire stay that we were there and the pool for Hidden Valley Resorts is not the most well kept. The view of the mountains was obstructed due to the trees and brush but if you are just looking for a nice cabin and peaceful stay then def book this cabin! Our family created memories that are worth a lifetime! Excellent location and value, will be staying there in the future. we had a wonderful time at fleur de lis. everything you would need was there, furniture and beds were very comfortable. location was close to everything and road to cabin was great. check in and check out is very simple. We loved staying at Fleur de Lis! The Christmas decorations were beautiful, and the accommodations were comfortable! There are just a couple of things that need attention. One of the burners on the stove does not work. And the Jacuzzi in the main floor bedroom does not work. Also there is a problem with the fireplace so that the remote does not work. One of your maintenance men came and showed us how to start without the remote, but the problem should be fixed. Those are minor things, but we thought the owner would want to know about them. Again, we had a very enjoyable stay and will definitely come back at some point in the future. The Fleur De Lis cabin yet again far exceeded my expectations. My family loved every minute of being there. The best part was how decorated the inside of the cabin was. Thanks for always going above and beyond to exceed your customer’s expectations and I look forward to coming back next year. The cabin itself was great. We just didn't realize just how close the other cabins were next to it. We usually stay in a more secluded cabin so that's probably why we felt this way. No privacy on either of the porches. Thank you for your review. We are delighted that you enjoyed your stay with us at Fleur De Lis. We apologize for any inconvenience with privacy issues you encountered during your stay, and we appreciate your feedback. We hope that we will hear from you again soon. Do not forget about our return guest discount! We really enjoyed our visit to Tennessee and our stay in the Fleur De Lis cabin. We have traveled to Tennessee and have stayed in many different cabins over the years and this cabin ranks in our top three favorites. We had four guests to stay in the cabin even though it is well equipped for four or more guests. Our young adult children enjoyed their king sized bed bedrooms with their own private bathrooms. The cabin was ready and very clean when we arrived and Express Check In was so easy. The beds were comfortable and extra blankets were available for the cooler nights. We used all of the amenities offered to us and my only suggestions would be is to tighten springs in joystick and control buttons on the multi-arcade game and wash and clean the front and back windows in the family room on the main floor so guests and enjoy the view from the inside also. Even with those suggestions, I would definitely come back for a stay and encourage others to stay in this cabin. Beautiful cabin!!! Great location, very well stocked with everything including kitchen supplies and a perfect size for a few families. Would love to stay here again! Jacuzzi tub in master is still leaking. Also wifi is not strong at all, especially on main level. Wasn't able to connect to cable on the living room tv. Did not ruin the stay though. There is so much more to do around the cabin and in town. Thank you for sharing this beautiful cabin with us!!! The cabin is very beautiful, well-kept and well-managed. It had a "home away from home" feeling!!! There was more than enough space for our group of 10. There is a wooded view from this cabin. The beds were very comfortable and the hot tub was great.. The kitchen and dining area was very spacious. We were really surprised at how much dishware and the selection of cookware there was. We had everything we needed for any type of meal we wanted to cook. The cabin was only a few miles from everything we wanted to do. Check in process was very quick and efficient. Check out process was even better- just send a text! We only had a few minor mentions: there were a few cobwebs in the ceiling fans in the downstairs bedrooms, the bathroom floors, which were tile, could use a deep clean. Most of the flooring in the cabin is hardwood, but two of the downstairs bedrooms has carpet that shows its age. Other than those, everything about this cabin was great! We had an issue with our TV and internet service when we arrived. The maintenance crew that was sent out came promptly and took care of our issues in a timely manner. The staff that came out were very friendly and offered local suggestions. The internet is not the greatest, though, but I didn't expect high speed access in the mountains. The adults enjoyed the pool table and the kids loved the arcade games and this kept all very busy for hours. We did go to the pool and that area was nice as well. This was our first time to Tennessee and we will definitely use Cabins USA again. Thank you for a wonderful stay! I am so happy to hear that everyone enjoyed their stay in Fleur De Lis. We here at Cabins USA strive to give each of our guests the best stay possible while vacationing in the Smokies. When you are ready to stay with us again, please mention you are a return guest for an additional discount. Thank you for choosing Cabins USA and we look forward to having you as our guest again soon! The cabin was beautiful and very clean, we had enough supplies like toilet paper, towels, etc. The hot tub was ready for use when we arrived. This is our first time staying in a cabin but we all loved it! The area is beautiful, very peaceful and relaxing. The only issue we had was we had no wifi when we arrived and I called but they couldn't come til the next morning and we did get it fixed. 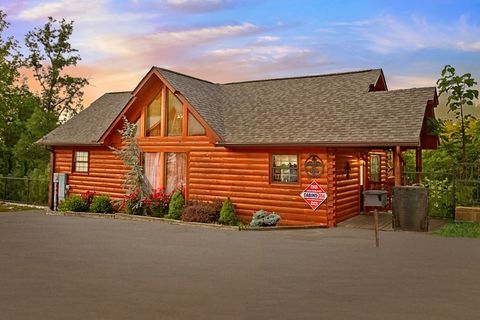 My family and I will definitely be back to the smoky mountains and will continue to go through cabins USA, the price was very good for the quality. We really enjoyed the cabin, it accommodated our 12 person group. The WiFi connection was not good, but that was the only thing that could be improved. It would not prevent us from staying here again. The location was only about 10-15 mins to eating areas and the mall. The cabin is very nice, however needs the dishwasher fixed (keeps falling out like it is not bolted down), and the refrigerator shelfs need repair (we barely had room in our frig and most of the door shelfs are missing). The WiFi for this cabin never worked during our entire stay. We called for support and were originally told it was the weather, and it never worked on the clear days. We were able to use the neighboring cabin WiFi for 1-2 days, and that also quit working and had sporadic service. HIghly recommend providing a real dish detergent for washing dishes in the sink. The very small sample bottle is such cheap soap it was terrible to wash dishes with, expected better when renting a high end cabin. Also, recommend having at least 2 kitchen wash cloths and towels. When you are washing one set, there is nothing to use in the kitchen but bathroom items, and we shouldn't have to. The cabin itself was roomy and a great place to stay. Very nice resort and a beatiful location. It's a nice cabin but we had no wi-fi and the hot tub wasn't operational until our last day. The staff was nice but seemed overwhelmed and took a while to get to us. No complaints, but would be nice to have broom and mop to clean up little messes. I am so happy to hear that you enjoyed your stay in Fleur De Lis! I apologize there was no broom at your cabin. That has been forwarded to our housekeeping department to be addressed. When you are ready to stay with us again, please mention you are a return guest for an additional discount. Thank you again for your review and thank you for choosing Cabins USA! We had a great stay in this cabin, really enjoyed the family time. However, the hot tub never got hot and we had the toilet leak on one of the beds downstairs. The WIFI was weak and useless. However maintenance was quick to take care of the leak and we did not complain to them about the hot tub. I am sure they would have addressed it if we had. Cabins USA was a great company to rent from and seemed to be on the ball. Will definitely rent from them again. Thank you for taking the time to let us know about your recent stay in Fleur De Lis! We here at Cabins USA work hard to make sure each of our guests have the same great stay you enjoyed while vacationing in the Smokies. I apologize for the issues you experienced with the hot tub during your stay. Your comments have been forwarded to maintenance had will be addressed. When you are ready to stay with us again, please mention you are a return guest for an additional discount. Thank you again for your review and thank you for choosing Cabins USA! We loved the location of this cabin and it was very nice, our only complaint was we were only given 1 trash bag, one roll of paper towels and the cabin didn't have a measuring cup at all! Luckily the cleaning service for a cabin across the road gave us some trash bags which was nice of them! We've stayed in several cabins through cabins USA and this has never happened! Other than that it was a beautiful cabin and we had a great time! Thank you for letting us know about your recent stay in Fleur De Lis! We here at Cabins USA work hard to make sure each of our guests have the same great stay you enjoyed while vacationing in the Smokies. I apologize for the issue you experienced with the lack of supplies. Your comments have been forwarded to our housekeeping department to be addressed. When you are ready to stay with us again, please mention you are a return guest for an additional discount. Thank you again for your review and thank you for choosing Cabins USA! We loved the cabin and the location. We will try to stay in Hidden Valley Resort from now on and we come to Pigeon Forge a lot. I wish the bathrooms were bigger but it was OK. The only problem we found was this cabin did not have a name on it and it didn't have the cabin number on our reservation directions. directions were good but cabin needs name on it or number on reservation directions. Thank you for taking the time to let us know about your recent stay in Fleur De Lis! We here at Cabins USA work hard to make sure that each of our guests have the same great stay you enjoyed while visiting the Smokies. Thank you for letting us know about the missing sign for the cabin. This has been forwarded to our Owner Liaisons and they will make sure that is corrected. Thank you again for choosing Cabins USA and we look forward to seeing you again soon! Great experience!!! This is the fourth time we have used Cabins USA, and we will continue to use only them! They responded to me right away, helped me find everything I was needing, and everything was ready when we got there! We arrived at about 9pm, got to the cabin, and it was beautiful as always! Even had Christmas decor!! I highly recommend Cabins USA to anyone wanting to have a great experience in the Heart of the Smokies!!!! Thank you for all of your kind words and thank you for continually choosing Cabins USA when you visit the Smokies! We work hard to make sure that each of our guests have the same great experience when staying with us. Thank you again for choosing Cabins USA and we look forward to seeing you again soon! We had a wonderful visit. The cabin was clean and comfortable. The express check in was awesome! Thank you for an enjoyable visit to the mountains! I want to mention how I like the new express check in and check out process. I have been renting through Cabins USA for about 12 years and this was the best check in ever. Being able to check in ahead of time, bypass the downtown traffic and go straight to the cabin, was great. We had a great time and enjoyed our time at Fleur De Lis. I called to report a couple maintenance issues, a TV and faucet handle. They were addressed promptly by maintenance tech Cody. He was very friendly, courteous and helpful. He even addressed a couple things (light bulbs) I hadn't mentioned in the call. Thank you, Cody!! Thank you so much for all of your kind words! We here at Cabins USA work hard to make sure that each of our guests have the same great stay you enjoyed while vacationing in the Smokies. When you are ready to stay with us again, please mention you are a return guest for an additional discount. Thank you again for your review and thank for choosing Cabins USA! I was displeased with the booking process because I originally had talked to someone who was supposed to email me information on another cabin which I never received. As for the Fleur De Lis, the booking was ok. The cabin had a few things wrong (i.e., handle on the kitchen faucet, blinds torn, clocks not working properly), but when we called to report the problem, Doug with maintenance came out quickly. He was very friendly and shared some information with us regarding dining, attractions, and other. Very nice cabin. Would like to stay here again! I am so happy to hear that you enjoyed staying in Fleur De Lis! When you're ready to stay with us again, please make sure to mention that you are a return guest for an additional discount. Thank you again for your review and thank you for choosing Cabins USA! Though we only stayed 1 night, we were extremely satisfied with the house and the staff. The house.was clean and neat and beautiful. Would definitely recommend it.! Thank you for all of your kind words and your recommendations! One of the highest compliments we can receive is when our guests recommend our cabins to their family and friends. When you are ready to stay with us again, please let our reservationists know you are a return guest for an additional discount. Thank you again for your review and we look forward to having you as our guest again! Beautiful setting and accommodations - children loved the family game area. Loved the king sized beds and tv's in every bedroom. Thoroughly enjoyed our stay. I am so happy to hear that you enjoyed your stay in Fleur De Lis! Our owners work hard to make sure that each of our guests arrive to a beautiful cabin that is comfortably decorated! When you are ready to stay with us again, please let our reservationists know that you are a return guest for an additional discount. Thank you for choosing Cabins USA and we look forward to seeing you again soon! We did have trouble getting on wi-fi at times. A staff person came out and got us online but it was not always a good connection. I noticed a previous lodger had mentioned a similar problem. Otherwise, we had a good time and enjoyed staying at the cabin. Everything was perfect! Very nice and bright. Great views! Thank you for your review. We are delighted that you enjoyed your stay with us at Fleur De Lis. We hope that you will decide to use us again in the future for your Smoky Mountain Lodgings. We stayed her for 3 Nights and had the best time ever, This is our first time stay with Cabins USA, I have been a long time visitor and used another company for many many years but I do believe we have found a new company :) The cabin is absolutely gorgeous, very comfortable. The beds are VERY COMFORTABLE!! Everything was very clean and love "makeup" towels in each bathroom! I have also posted a review and pictures on Trip Advisor. Only thing that needs improvement is a strong router for the wifi, and a new can opener, the electric one does not work and the manuel didn't either. The kitchen is very well stocked that included an ice tea maker and 2 crockpots :) there was even a waffle maker. Thank you for your review. We are delighted that you enjoyed your experience with us at Fleur De LIs. We apologize for any inconvenience that you may have had during your stay with us. Please always feel free to call our office with any questions or issues with the cabin. We would be more than happy to replace any items that may not be working during your stay with us. We look forward to hearing from you again soon for your next Smoky Mountain getaway. Do not forget about our return guest discount. The cabin was beautiful and clean. The only issue with the cabin was the sofa sleeper downstairs. The mattress was paper thin and therefore the sleeper portion was useless. The road getting to the cabin has a lot of blind curves but the cabin itself was very nice. Thank you for you review. We are delighted you enjoyed your stay with us at Fleur De Lis. We have had the sleeper sofa inspected by our maintenance staff. The sofa sleeper has a normal sized mattress for a sleeper sofa and is in good condition. We hope that we will hear from you again soon. Wonderful family vacay! Thank you Cabins USA for giving us a beautiful cabin to build new family memories in! This was our third trip to Pigeon Forge & we have stayed with Cabins USA each time. We love you guys! We enjoyed our stay very much. There were some minor complaints but nothing that would keep us from coming back. Thank you for choosing Cabins USA. We are glad you enjoyed your stay with us, and we apologize for the minor complaints. We look forward to hearing form you again soon to get your next Smoky Mountain getaway booked. Winter weather caused a couple of glitches in our stay but we still had a great time. Our original cabin booking was on a steep road that was iced over so we had to go back to the office. The staff was prompt and courteous with assigning us to this cabin. My group had also hoped to use the hot tub but it wasn't filled up/cleaned. Nonetheless, I am likely to utilize this cabin again if I have a group trip. Thank you for taking the time to write your review Rhonda. We are delighted that even with the weather we were able to provide you with a wonderful stay. We apologize for any inconveniences you may have encountered, and we hope to hear from you again soon. When we arrived at the cabin in the late evening with 9 tired ladies we were excited to hit the hot tub. However, there was no water in it and it was completely drained. Then, we could not get the WIFI to work - wrong information on the brochure we were given plus someone who had stayed before us had sabotaged the system, took some of the remotes and pulled the plugs out of the back of the TVs. We were able to get WIFI to work after two very nice gentlemen came to fill up the hottub and reset the system. Thank you so much for the returned phone call from the Manager who gave us a free night return stay! Great customer service and a big thank you for compensating a 10+ year client! We will definitely be using it. Suggestion: Would be when cleaning service cleans - they check behing the nightstands for (phone chargers) I left mine and had to call back and they went back and found it! - Make sure the TV remotes for each TV is placed near the TV and make sure TVs are working properly. The wrong remote won't work on every TV. Perhaps it would be a great thing to put directions on how to program the remotes too! We spent over an hour trying to get the TVs to work. Also, all the plates, bowls and silverware were nasty and put in the cabinets. The washing detergent is watered down. I brought my own - DAWN and washed them all and then placed them in the dishwasher. So, perhaps the dishwasher isn't doing it's job in this cabin. Don't remember having this problem last year. So, its worth checking out. I hope this honest review is appreciated. I am not a picky person, but dirty dishes, no water in the hot tub and no WIFI, and TVs not working is not what I expected for our women's get away to relax weekend. We stayed in this cabin last year and love it! I have used Cabins USA for a very long time and will continue to use your company. Thank you for taking the time to write your review and for your suggestions. They are greatly appreciated. We apologize for the inconveniences you did encounter and I am glad that our maintenance staff was able to assist you in a timely manner. We enjoy making our guests happy, and it is our pleasure to offer you anything we can in return for great customer satisfaction. We will be looking forward to hearing from you again soon. Great cabin, really enjoyed the overall experience to make it a great weekend! Will definitely use CABINS USA in the future! It was awesome! The cabin was very clean and spacious, and exactly as it appeared on the website. I went there to celebrate my 30th Birthday and with friends, and we all can't wait to make reservations to come back and stay in the "Exact" same cabin(Fleur De Lis)! We had a wonderful family retreat at the cabin. A beautiful location and fun home to stay. Only improvement: the pull out beds are worn out and need upgraded. The kitchen and bedrooms were great. We were thankful for TV's in the bedrooms to find "personal time" The Hot tub was excellent and the living rooms and pool table areas were perfect for our time with family. Great cabin. Has a very homey feeling. Very clean. Enjoyed all the cooking utensils provided. Will definitely use this cabin again. Cabin was nice- enjoyed our stay immensely. Not too far from the Parkway. The area was very nice and quiet and roads were good. I would suggest that you have a broom available for guests use- we had small children with us and after meals it would have been nice to be able to sweep the floor -it was quite messy by the time we left after 6 days. Also, had a little trouble with the hot tub not heating up enough and the WIFI did not work. One other note- your staff needs to be a little better equipped to answer questions about the rental- I inquired about parking and she stated she did not know, she told me the pool would be closed due to the season, which was wrong and when I questioned her she put me on hold to find out for sure. Parking is pretty important when you have people coming from different areas and have multiple cars- we had enough parking-but due to her answers I was expecting we would not and she did not have any suggestions for me other than parking at your office building and car pooling. I would stay at this property again as none of the above would prevent me from doing so-but, I am thinking any suggestions would be helpful to you for future bookings. What an experience. This was a "stay-cation" for my family and my sister's family. I live close by, however, they were visiting from TX. This property was great. The location was easy to get to and close to EVERYTHING. The weather was the only thing that was not on our side (it rained most of the days) however, the pool table and the hot tub kept us all occuppied. We also loved the large table in the kithen. It gave is the opportunity to have our family meals together and also gave a great site for board games. This place was exactly what we were looking for. Also it was more than the property... your staff was amazing. Our checkin was great and smooth. They answered LOTS of questions that I had and also had great suggestions. Thank you for making our trip a GREAT one. We loved our wonderful stay at this beautiful cabin. Everyone on the staff was so helpful and nice. The views were amazing. Our children also loved the indoor pool. Thank you for a great vacation. I would recommend this cabin or any of these cabins to anyone!! We had a great time although on our first day there we noticed the floors were very dirt and was turning all or socks and feet black. My wife was irritated because there were other persons hairs on the sheets in our bed, so we had used our own that we brought . We also had a bathroom door on the lower level that was falling off the hinges. But worst of all our WIFI wasn't working and I know that sounds funny but we had brought out Lap top and other items that required it. I called the front desk the next day and they took care of bathroom door. They also sent someone for the WIFI but it didn't get fixed. I spoke with a manager named Molly and she said they would attempt to get hold of the owners but regardless it would get taken care of the next day. We continued with our vacation for the next few days and we never heard back from Molly or anyone else so we never had WIFI in our cabin for the trip. So over all the cabin and our trip was great except for the cleanliness of the cabin and our WIFI issue. Thank you for providing feedback from your recent stay with us in Fleur De Lis. We would like to apologize for the issues that you had with the cleanliness of the cabin and with the WiFi. These issues have been handed to our management team to troubleshoot and ensure that it does not happen again. I do apologize that you did not hear back from our office regarding the wifi. A member of our management team will be contacting you shortly to discuss this issue. We do hope that you will give us a chance on a future stay. Thank you again for your business. The only thing we did not like about our stay was that the Cabin was not clean upon entry. We stripped all the beds and washed the covers because the covers was nasty and had bugs, looks like dog hair, and stains on them. This was very unsatisfactory but other than that we had a awesome time. We loved the cabin, large & roomy for our family. Loved the dining table, enough chairs for us all to eat together. There were plenty of cooking utensils & table ware. We could not connect to the internet, tried several times & just gave up. That's not really a big deal, but might be important to some people. This isn"t a Cabin's USA problem, rather a resort problem, but in the eve, the sewer gas smell was horrible. We couldn't be outside to enjoy the deck or hot tub. You might want to invest in a new cleaning company. The cabin is in dire need of a thorough cleaning. The bathrooms were the only rooms that were clean. The one complaint we had would be the internet access. Way too slow. Reminded us of dial up. This was a great cabin. The owners have really appointed it nicely. My whole family was able to stay very comfortably and we had a great time. THE CABIN WAS WONDERFUL. WE HAVE RENTED THRU CABINS USA ON SEVERAL OCCASIONS AND WE HAVE ALWAYS BEEN VERY SATISIFIED. This was our first time to stay in Fleur de Lis and the first time in Hidden Springs Resort. We have used CabinsUSA several times and are always satisfied. Very friendly and helpful not to mention they are always affordable. Fleur de Lis was magnificent. This cabin was very clean and had everything we needed. There were plenty of towels and lots to cook with. We even had a big thanksgiving type dinner since we were all together and we had plenty to cook with. The only problem we ran across is that the washer and dryer are really too small for such a large cabin that holds that many guest. We had to do a lot of loads to wash everything we needed. Other than that we were extremely satisfied and I would love to stay in this cabin again!! Thank you for choosing Cabins USA. We are delighted that you had a wonderful experience with us at Fleur De Lis. We apologize for the inconvenience you experienced during your stay. We hope to see you again soon when you next visit the Smokies.